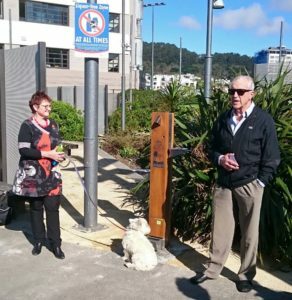 It may seem odd that a route that runs continually by the water needs a water fountain, but walkers and cyclists on the Great Harbour Way/Te Aranui o Pōneke will be grateful for a new water fountain installed at Chaffers Marina on the Wellington Waterfront section of the GHW. You can refill your plastic water bottle or drink directly. Canine companions have a special water bowl at the base of the fountain.